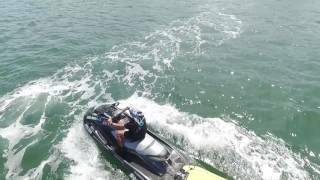 Caloundra Jet Ski is Queensland's premier jetski experience. 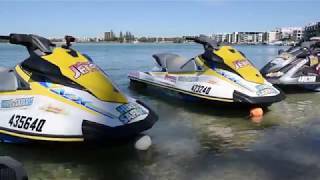 Operating in the Pumicestone Passage and Moreton Bay Marine Parks, Caloundra Jetski is a water based safari company offering fast paced tours of nature, wildlife and ancient volcanoes aboard clean green fun machines. Unlike other eco-adventures, you're in charge! You get to the do the driving! The chief guide and instructor Ken will show you how to ride and then take you on the trip of your choice - anything from a gentle 50 minute ride, through to a half day Epic. There's a 60 minute adrenalin infused Bribie Blast and a 90 minute Glasshouse Twister which takes you deep into the marine park - home to turtles, dolphins, dugongs and over 300 different types of migratory and wading birds. 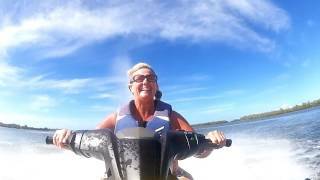 Caloundra Jetski is a bit like having a friend who can teach you to ride, who knows Pumicestone Passage, knows where the sand bars are and if you’re curious, can tell you what makes this marine park tick. It’s more than an adrenalin blast, it’s more than an eco adventure. It's an experience! A 30 kilometre free wheeling adrenaline blast along the western bank of Bribie Island to historic Lighthouse Reach - a hideaway where locals go for high speed adventure. On this trip, they administer just the right dose of adrenaline to suit you. Learn about this area's unique history and its extraordinary geological links with the volcanoes of the Glasshouse Mountains. Their most popular! Combine the thrills of the Bribie Blast with an eco-adventure taking you deep into the Marine Park, twisting and sliding your skis through 50 kilometres of a mangrove lined channel. Look out for marine turtles, dolphins, dugongs and 300 species of wading and migratory birds which fly around the world to spend a few months here. They get you there and back in 90 minutes. 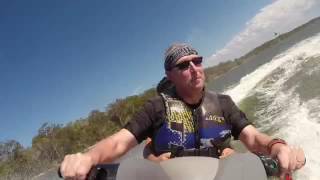 A jet ski ride for nature lovers! A full on half day trip riding the entire length of Pumicestone Passage with stops at Lighthouse Reach, the Glasshouse Mountains and the seaside villages of Donnybrook, Toorbul and a refreshment break at Sandstone Point. 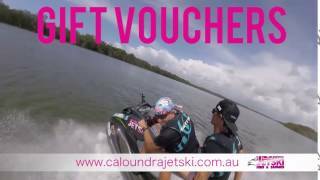 Included in the price water and snacks for the trip and a meal at Sandbar Cafe overlooking Pumicestone Passage on your return to Caloundra. Full of surprises! This is the gentle alternative – a laid back, relaxed chance to see Caloundra city from the water on a clean green fun machine. 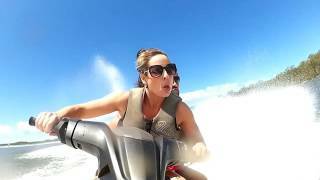 Leaving from Bulcock Beach, learn how to handle a jetski at low and high speed, ski along the western bank of Bribie Island, across Pumicestone Passage, carve out some hot laps and on your return, promenade along the Esplanade in downtown Caloundra. An exhilarating adventure to share with your team, your colleagues, your customers, your family and your loved ones – an experience combining jet skis, high powered karts, exquisite scenery, ancient volcanos, a seafood extravaganza on the waterfront, and drinks at an exclusive resort! This is the best of the best – a five star collaboration between four bespoke businesses on a circuit through national parks – on land and on water. It’s an intimate experience for eight to 16 adults – small enough to adjust the adrenalin dose so everyone enjoys this fun adventure. The perfect whole day adventure experience for team building, business events, corporate functions, birthdays and bridal parties.